Rachel Heath’s work is on view at the ICA in the exhibition Exposed: Today’s Photography/Yesterday’s Technology thru Sept 19, 2010. 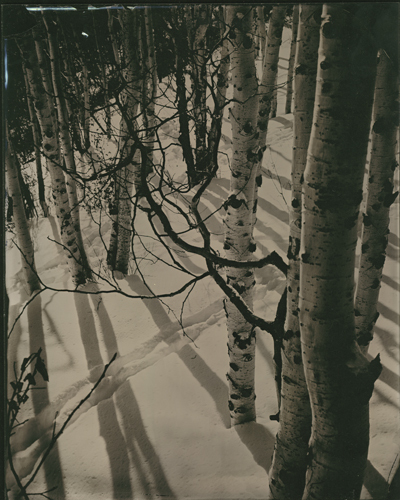 19th-century landscape photography required transporting the entire darkroom to rugged and often uncharted territory. Similarly, contemporary artist Rachel Heath travels with her large-format camera and portable darkroom to capture intimate landscapes using the wet plate collodion process. Heath is acutely aware that the work is in conversation with the long-standing tradition of landscape photography. She writes, “the traditional western landscape photograph regards horizon, ridge-line and distance as a grand vista on which one can impose one’s own presence and fantasies.” Heath considers this complex relationship between idealized images of nature and man’s relationship with the landscape in her work. However, for Heath, making the work is not just about the nostalgia of the landscape. She is also interested in how the antiquated process she employs calls attention to her hand in the work, often resulting in uncertain and surprising details that are not possible to achieve with digital tools. The collodion process she uses creates a surface for the exposed silver that produces a nearly grainless image. Also, because the plate is hand-made, its surface is never uniform, which often results in unexpected and painterly patterns in the background of an image. Based in Oakland, Heath received her MFA from the California College of the Arts (CCA) and her BFA from UC Santa Cruz. Her work has been exhibited in San Francisco at Stephen Wirtz Gallery and at CCA. Nationally, her work has been exhibited at New Orleans Center for the Photographic Arts, and the School of the Museum of Fine Arts in Boston. Andreas Hablutzel’s work is on view at the ICA in the exhibition Exposed: Today’s Photography/Yesterday’s Technology thru Sept 19, 2010. 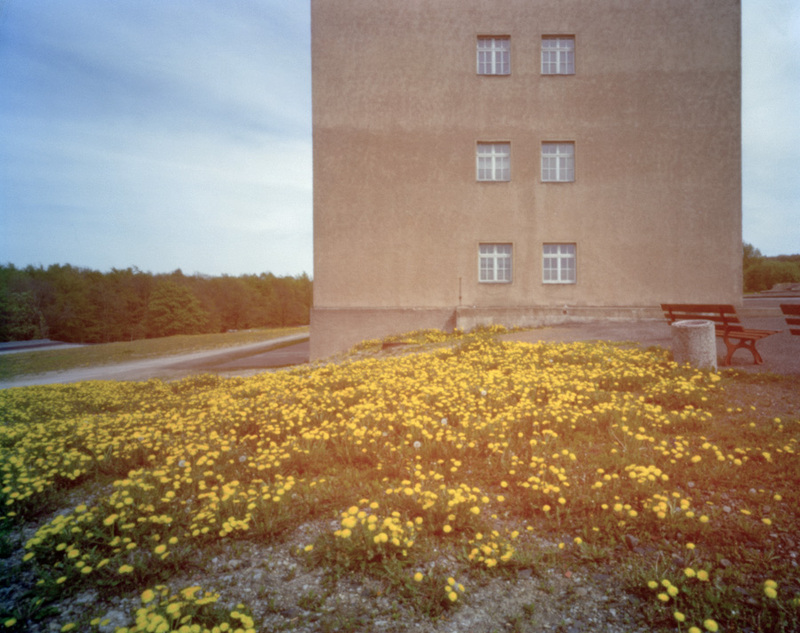 Andreas Hablutzel’s photographs document the site of the former concentration camp Buchenwald in Weimar, Germany sixty-five years after its liberation. The pastoral landscapes depicted here defy the horrors that were committed at this infamous site. However, the images transmit an ominous sense of evil. One knows that something has happened here, but it is not immediately apparent. Instead it is the memory of the place that survives in these images, the haunting inexplicability of Nazi atrocities. In order to capture that foreboding quality in his photographs, Hablutzel has chosen to use a pinhole camera, the most elemental form of camera capable of producing an image. It consists of a closed light-proof box with a pinhole opening on one surface. Through the pinhole, light projects an inverted image of the subject onto a flat, light-sensitive material that has been placed on an internal surface opposite the opening. Because so little light enters through the miniscule opening, the negative material must be exposed for a long time. Therefore, the resulting images have a soft overall definition rather than crisp detail. Andreas Hablutzel is a photographer and architect living in Brooklyn, New York. He received a BA from Rice University in Houston, a Masters of Architecture from the Southern California Institute of Architecture in Los Angeles, and an MA in Photographic Studies from the University of Westminster in London. 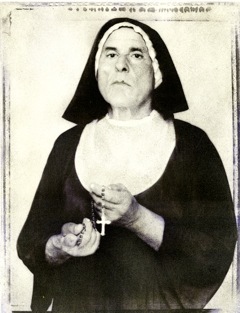 His work has been exhibited in the United States, Switzerland, the United Kingdom, and Estonia. Joy Goldkind’s work is on view at the ICA in the exhibition Exposed: Today’s Photography/Yesterday’s Technology thru Sept 19, 2010. In a haunting series of black and white portraits titled Girlfriends, Joy Goldkind set out to make images that would explore the unexpected aspects of a subject’s persona lying beneath the surface. The sitter is Goldkind’s husband, who donned costumes and make-up in order to assume numerous female characters — from a bride to a nun to a fortune teller to a cross dresser, to name but a few. However, despite the variety of characters being depicted, the facial attributes are identical in each image. Goldkind has worked with numerous photographic processes from wet-plate collodion to platinum prints, only eschewing digital photography. She now works exclusively with the time-consuming and labor-intensive Bromoil process, in which a silver gelatin print is bleached to remove the silver and then inked with lithograph ink. The images are hand crafted using brushes, which adds a layer of mystery to the photos. Goldkind finds that she is able to manipulate the process to get more abstract than traditional photographic portraiture. She uses a double exposure and slow shutter speed to change what is true and expected in an image. According to Goldkind, “This method allows me to alter a traditional photograph and create a unique painterly print.” She has the freedom to soften, blur or completely erase an aspect of the original negative. While these bizarre images were made using this historical technique, they are quite certainly from the 21st century. Goldkind was born in New York City in 1943 and graduated from the Fashion Institute of Technology and has studied at the International Center for Photography as well as Palm Beach Photo Center in Delray Beach, Florida. She began as a fashion designer for children’s clothing but resigned after ten years to raise her family. At the age of 50 she took up photography. In the fifteen years since, her work has been shown in group and solo exhibitions across the country and is included in a number of private collections. Nathaniel Gibbon’s work is on view at the ICA in the exhibition Exposed: Today’s Photography/Yesterday’s Technology thru Sept 19, 2010. 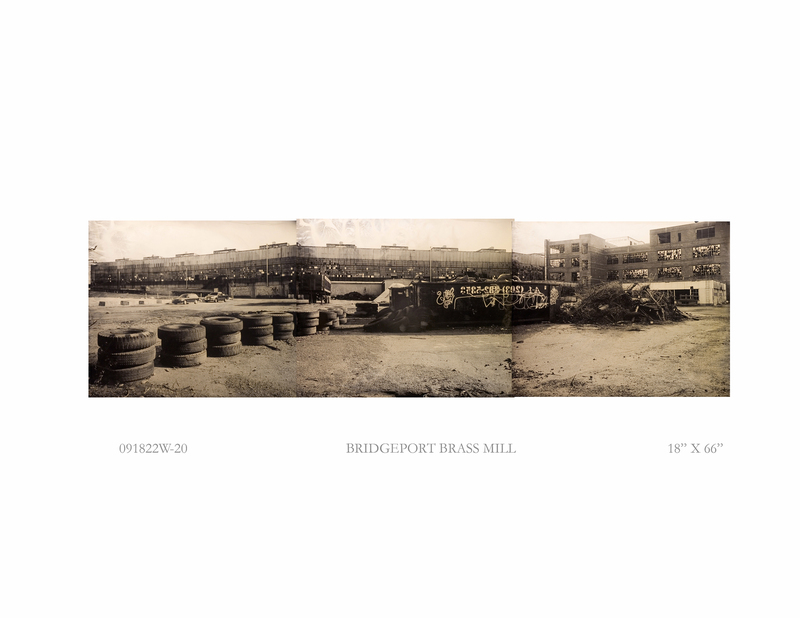 In Bridgeport Brass Panorama, Nathaniel Gibbons documents the details of urban decay. Just as the early photographers traveled with their darkroom and cumbersome equipment when shooting photographs outdoors, Gibbons has outfitted the back of his Chevy as a portable darkroom to prepare and develop his one-of-a-kind images. For tintypes, his work is considered large in scale since the image is the same size as the view camera’s lens. Bridgeport Brass Panorama is a triptych, with three unique images taken all on the same day and time. A master at his craft, Gibbons’ process is slow and methodical while also open to the chance and serendipity of the process. Gibbons is based in Connecticut and has been making tintypes for more than thirty years. His work is held in the public collections of Yale Art Gallery, the Museum of Fine Arts, Houston, the Library of Congress and the Museum of Modern Art. Does he by any chance give lessons on how to make tintypes? Thanks for visiting our blog! I’m not sure if Nathaniel gives lessons. He lives in Connecticut. His email address isnawagi@yahoo.com, if you wish to contact him. If you live in the Bay Area, you might want to get in touch with Michael Shindler – another “Exposed” artist. He made tintypes at a Talking Art program we ran in August. Fabulous! His email address is shinco@gmail.com. There is a blog post about his work as well. I sent an email to both Mr. Gibbons and Mr. Schindler, unfortunately my email to Mr. Gibbons didn’t go through (i tried to send it from both my yahoo and my school email, i got a mailer-demon in response to both tries). My email to Mr. Schindler seems to have gone through though so i now just have to wait for a reply. Again, thank you for the information. Binh Danh’s work is on view at the ICA in the exhibition Exposed: Today’s Photography/Yesterday’s Technology thru Sept 19, 2010. Oliver Wendell Holmes, Supreme Court Justice from 1902-1932 and one of photography’s first great critics, called the daguerreotype “a mirror with a memory.” As the first photographic process to have widespread commercial success, the daguerreotype rendered detailed images on a polished and reflective surface. In his artwork, Binh Danh utilizes the mirror-like qualities of a daguerreotype to reflect upon histories of the past. Born in Vietnam, much of Danh’s work investigates the human and spiritual aftermath of the Vietnam War (or American War, as they call it in Southeast Asia). In these daguerreotypes, some of the source images come from the archive of the Khmer Rouge, the totalitarian ruling party in Cambodia from 1975-1979, known for ruthlessly executing innocent civilians after carefully documenting them. Additionally, Danh creates daguerreotypes based on his own photographs taken in Cambodia of contemporary Buddhist monks and ancient temples. The mirrored surface and relentless detail of the daguerreotype provoke self-reflection while invoking memories of the past. Danh makes his daguerreotypes in his garage, coating a sheet of copper with several layers of silver. After he carefully cleans and polishes the plate, he fumes it with iodine and bromine in a closed container to produce a light sensitive surface. He then exposes the sensitized plate and develops it by the chemical action of mercury vapors on the exposed silver iodide surface to produce an image. Based in San Jose, Binh Danh received his BFA from San Jose State University and his MFA from Stanford University. His works are held in the collections of the Corcoran Art Gallery, The Philadelphia Museum of Art, the deYoung Museum, and the George Eastman House, among many others. He recently received the 2010 Eureka Fellowship from the Fleishhacker Foundation.